Boyne Resorts has been a major player and innovator in the ski industry for over half a century. In addition to running many successful ski areas in North America, Boyne has pioneered major advancements in lifts and snowmaking. Boyne ski areas have the distinction of featuring the first triple, quad, and high speed six pack in United States history. Boyne Resorts was founded by Everett Kircher (1916-2002), a Missouri native whose family moved to Michigan when his father, John, sought one of Henry Ford's famous $5 per day jobs. Everett quickly grew to be a successful young entrepeneur, developing a trailer dealership and later a Studebaker dealership. Kircher first acquired a pair of skis at the age of 20 and soon found himself going on trips to Lake Placid and Sun Valley. Developing a love for skiing, Kircher constructed a portable rope tow with lights, which he and friends would set up at local hills after work. Seeing the potential for more than just the small community areas in Michigan, Kircher began searching for a location to develop something larger. 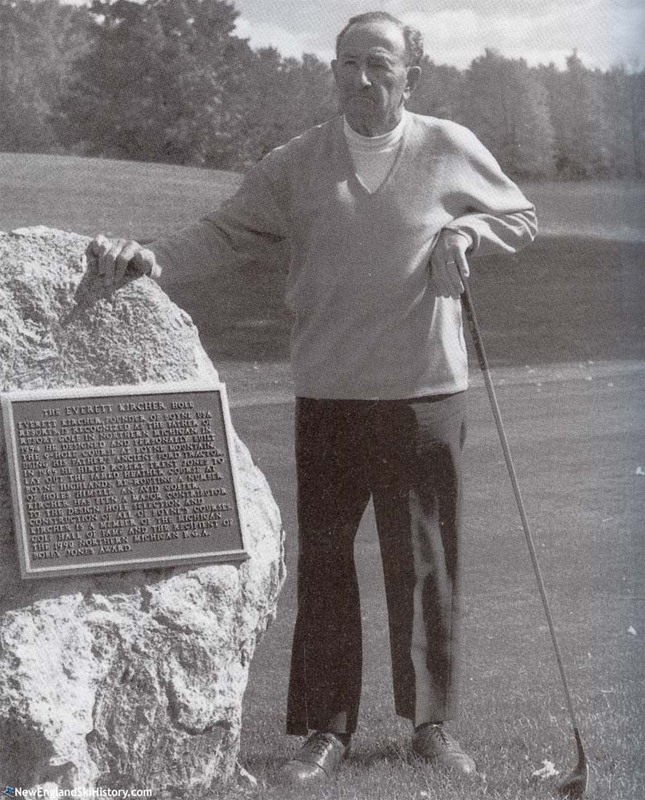 In 1947, he purchased land on Boyne Mountain in Michigan for $1. Kircher used Sun Valley has his inspiration, and even acquired the 1936 single chairlift from Sun Valley's Dollar Mountain. The ski area opened on January 1, 1948 with two trails served by the chairlift. On June 14, 1948, Boyne Mountain Lodge, Inc. was incorporated in Michigan, with Everett Kircher, John Norton, and James Christianson each acquiring five thousand $1 shares and serving as directors. While all three were involved in the initial development, Christianson soon left to embark upon a career in the media, while Norton cashed out his shares. After receiving an inquiry in 1953 about constructing a scenic chairlift, Kircher headed to the Smoky Mountains in Tennessee. Seeing the potential, Kircher procured an easement on Crockett Mountain and acquired a chairlift from Sugar Bowl Ski Area in California. With the help of his father, Kircher was able to open the attraction in 1954. The lift was deemed a major success and provided much needed non-winter revenue. 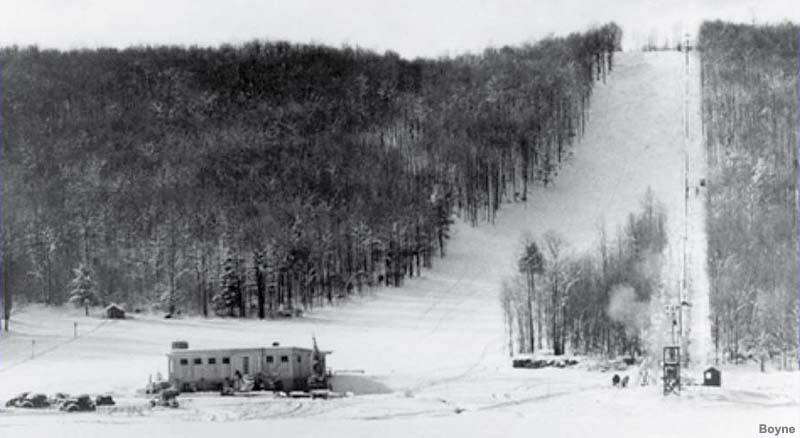 In 1955, a group of local investors started the Harbor Highlands ski area in Harbor Springs, Michigan. Debuting with surface lifts and a few trails, the area soon found itself in financial trouble. Meanwhile, around this time Thunder Mountain was established by Dorian "Dee" Adgate (1927-2005). After continued financial woes, Harbor Highlands ceased operating in the early 1960s. Kircher acquired the dormant area, procured thousands of acres of land around it, and reopened it as Boyne Highlands in 1963. Kircher reached out to Riblet with an idea for a three person chairlift, which resulted in two of the first triple chairlifts being installed for the debut of the Highlands. Two years later, at Kircher's urging, Heron installed the world's first quad chair at Boyne Mountain. Skier visits continued to grow at the Boyne ski areas as the 1960s progressed. In August 1967, Kircher announced the million dollar acquisition of Thunder Mountain and Walloon Hills, leaving only Nub's Nob and Barn Mountain as the only two regional areas not under his ownership. Both ski areas were improved, providing more weekend capacity during busy weekends. Thunder Mountain became a racing venue in effort to remove the crowd stigma from the main Boyne areas on race days. The four area portfolio was marketed as Boyne Country. In 1972, Boyne acquired the now-defunct Barn Mountain (formerly known as Avalanche), for a reported $125,000. Eventually deciding there was no sustainable future for it as a ski area, Boyne decided to strip the lifts and give away the land. In 1977, Boyne donated the property to the Nature Conservancy, with a deed preventing any future lift served skiing on the property. With skier visits dwindling, Walloon was eventually shut down in 1977-78. Walloon Hills was donated to a disabled skier charity run by Darla Evans in 1984 and subsequently renamed "Challenge Mountain." As the popularity of skiing in the west grew in the 1960s and 1970s, Kircher began searching for an area to acquire, thinking he could develop synergy with the Boyne areas. Though he looked into purchasing Copper, Jackson Hole, Keystone, Sun Valley, and Telluride, he deemed none of them made financial sense to acquire at the time. However, in the mid 1970s, the new Big Sky area in Montana was in dire straits following the death of its founder, Chet Huntley, and could be acquired for a reasonable price. In June 1976, Boyne Resorts acquired Big Sky for $1 million, plus $7.6 million in debt assumption. Boyne Highlands, Inc. and Boyne Mountain Lodge, Inc. merged on December 27, 1977, forming Boyne USA, Inc.
Circa 1984, Boyne Resorts closed Thunder Mountain and relocated the quad chairlift to the Super Bowl at Boyne Mountain. Kircher retained the Thunder Mountain property in case future demand warranted reopening it. One later proposal involved reopening the area as a snowboard-only facility. At the urging of Everett's son John Kircher, and with Big Sky finally nearing profitability, in December 1986 Boyne Resorts acquired Brighton in Utah. Boyne reportedly started turning profits at Brighton after two seasons. In 1997, Boyne Resorts purchased Crystal Mountain in Washington, quickly upgrading the area with new lifts and improved snowmaking. After eighteen years of losses, in 1998 the Kirchers discussed shutting down Boyne Mountain. In the end, the family instead decided to construct a hotel at the mountain and make the terrain more family friendly, which eventually reportedly put operations back into the black. Boyne Resorts expanded into Canada by acquiring Cypress Mountain in British Columbia on February 20, 2001. On January 16, 2002, Everett Kircher passed away due to kidney problems at the age of 85. His four children had assumed control of the company, with John running western operations, Stephen running eastern operations, Amy serving as Chairman of the Board, and Kathryn as Principle of Boyne Design Group. On December 22, 2005, CNL Lifestyle Properties, Inc. purchased Cypress Mountain and the Gatlinburg Sky Lift for $47.5 million, leasing both back to Boyne for operational control. On January 9, 2007, CNL Lifestyle Properties, Inc. purchased Brighton from Boyne USA Resorts for $35 million. Boyne then agreed to a 20 year lease with four additional 5 year options. On August 8, 2007, American Skiing Company sold Sunday River and Sugarloaf for $77 million to Boyne USA Resorts. CNL Lifestyle Properties, Inc. then purchased Sunday River, ME, and Sugarloaf, ME, from Boyne USA Resorts for $76.5 million. Boyne then acquired operational leases of two areas from CNL Lifestyle Properties, Inc., through 2026, with additional option years. On October 5, 2007, Booth Creek Ski Holdings, Inc. transferred the operational leases of Summit-at-Snoqualmie, WA and Loon Mountain, NH, to Boyne USA Resorts. On March 31, 2017, John Kircher acquired Crystal Mountain from Boyne USA Resorts, reportedly by swapping his shares of Boyne. On April 6, 2017, Ski Resort Holdings, LLC acquired CNL Lifestyle Properties, Inc.'s Boyne holdings. In May 2018, Boyne USA Resorts acquired the assets of its Brighton, Cypress Mountain, Gatlinburg Sky Lift, Loon, Sugarloaf, The Summit at Snoqualmie, and Sunday River areas from Ski Resort Holdings, LLC. Funding was provided by a bond offering.